Jennifer Johnson is a litigator who focuses her practice in the area of medical malpractice defense, employment law, auto defense and premises liability, as well as religious institution litigation. She devotes a substantial portion of her practice to defending physicians and hospitals, and has experience in both federal and state courts defending religious institutions. Ms. Johnson also counts amusement park organizations and recreational facilities among her clients. In her employment law practice, Ms. Johnson defends employers against claims based on harassment, wage and hour violations, and other torts, in addition to litigating matters concerning non-compete agreements and misappropriation of trade secrets. She has tried many cases to verdict and has defended her clients via motion practice, dispositive motions and trials. Ms. Johnson was a litigation attorney with a leading firm in Southwestern Indiana before she joined Hinshaw & Culbertson LLP in March 2002. 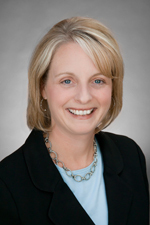 Ms. Johnson was named a partner with Hinshaw in 2004. "Voir Dire: Who Can You Strike and Why?" a teleconference presented to Hinshaw's Medical Litigation Practice Group, January 2010. Author of "Potential Liability Issues Arise in Illinois when Hospitals Electronically Scan and then Destroy Original Paper Records," Hinshaw Health Law Alert, October 12, 2005.